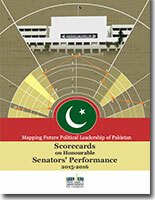 Last year in 2015, PILDAT conducted a mapping exercise of the political leadership in Pakistan, and produced a list of 21 top leaders of the country who were thought most likely to become Prime Minister of Pakistan in the next 15 years’ time. Although evolution of political leadership does not necessarily follow a logical and scientific process, PILDAT attempted to employ a rather scientific framework for the selection of these 21 potential Prime Ministers of Pakistan. This effort was made for the purpose of improving the quality of future leadership by inspiring the identified leaders to place a greater focus on their policy positions and refine their vision about a better Pakistan.